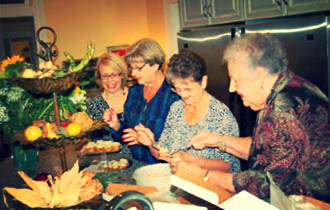 Newberry ARP Women seek to glorify God and enjoy Him forever by joining together in Christian fellowship so that each woman may be encouraged to grow in her knowledge of Christ and of the Holy Spirit's power, and may be equipped to serve in harmony with God's design for herself, her home, this church, and the world community. Our Ministry includes prayer and Bible Study, service to our church and community. We seek to learn more about God’s love for us and how we can share it with others. The Morning Circle meets on the first Tuesday of each month at 10 AM in the Carson Room for Bible Study, prayer, and fellowship. The Bible study is on the book of Genesis. To find out more information, contact Dr. Mary Baker, bakermary123@comcast.net. Weekly Bible Study meets on Tuesday, 7-9 PM, at a lady's home. To be included on the weekly email notice, contact Shannon Winters, 19golfaly@gmail.com , or Kristy Jennings, andrenkristy@hotmail.com.